Tsitsi Mutseta, who moved to San Diego from Zimbabwe eight years ago, said the garden helped ease her mind as she adjusted to her new life in the United States, far from her family. In addition, Mutseta is fighting cancer and said she told Obama the garden has given her a reason to live. "I told her I come to the garden to relieve my pain. I get food from the garden that is organic and it connects me with my family because I grew up on a small farm in Zimbabwe," said Mutseta, a tall woman who hugged Obama and gave her leaves from her kale crop. "She said she would pray for me and she loved what I did in the garden." In all seriousness, what this woman has experienced and is expressing in this article is exactly what I had in mind and can relate to myself as she describes how gardening is helpful during her cancer journey. The relief from pain, whether physical or emotional pain or both, through the active connection to the earth by gardening is healing for both the body and spirit. There is no stress of needing to understand or use a new language (whether a recent immigrant learning English or a new cancer patient learning suddenly thrust into the situation of needing to learn "medicalese"). Indeed, I don't believe there is any pill, vitamin, or cancer therapy that can do all of that, especially one that can produce so many benefits at such a low cost and without any side effects. A book that Michelle Obama and others might wish to read is The Earth Knows My Name by Patricia Klindienst, which lets immigrants to the US tell the stories of how their gardening efforts have helped them to retain their cultural heritage. I confess that I picked up this book, thinking I would "breeze through it". Not only did I not breeze through it, I read it three times. The first reading actually produced many tears, tears from seeing beauty but also tears that come with sadness and loss, feeling deep compassion for all that these immigrants had left behind along with the many difficulties that came with adjusting to a new life in the US (again, a path that cancer survivors often experience, as life is never the same again, even living in the very same place). The second time I read it, I read it slowly, very slowly, and let myself draw pictures in my mind as I imagined each garden and each gardener. The third time I read the book I actually read it aloud to my husband, just for the pleasure of hearing these stories, and imagining the voices of each immigrant as they expressed their hopes. I can honestly say that, even without any pictures in this book, it is one of the most beautiful and most emotionally-engaging book I have ever read. What this remarkable woman Tsitsi Mutseta has done, through her small garden in San Diego, is to do her very best to emulate the motto of this blog, i.e., to cultivate her own health through a garden's nourishment of both body and soul. I send her (and all others on a cancer journey) my heart-felt wishes for good gardening, health, healing, and hope! 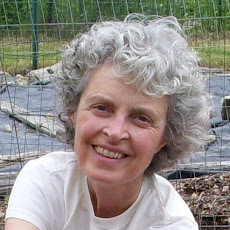 I'm a wife, mom, organic gardener and new farmer, Registered Dietitian, author of the book A Dietitian's Cancer Story, website CancerRD.com, and in between all that and more, I am a multiple time cancer survivor. I began my "Cancer Victory Gardens™" blog in March 2009. The dreaming, planning, planting, nurturing, harvesting, storing, sharing, and yes, also eating our home-grown fruit and vegetables nourishes both my body and soul as a major ingredient of my personal cancer recovery recipe. I hope that I can offer information and inspiration to everyone touched by cancer to help you cultivate your own path to health through a garden's nourishment of body and soul. Do You Have a Cancer Victory Garden™? As either a cancer patient or caregiver, have you planted one for yourself (even if you didn't call it that)? Is your cancer center growing food, including edible herbs and flowers? Would you like to share your experiences? If so, I would love to post some photos and a short story of why you enjoy your "Cancer Victory Garden". Feel free to send me an email at cancervictorygarden (at) gmail (dot) com. Please put "Cancer Victory Gardens" in the subject line.